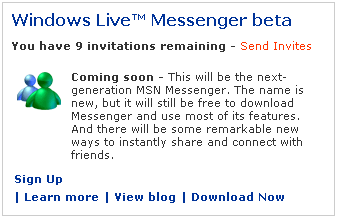 Playing about on the Internet on Sunday I managed to get myself on the Windows Live™ Messenger Beta trial (the new name for MSN Messenger). Today I have some invites to give away. Friends or donors are welcome to ask for them. I have some too, should anyone want any, although I’ve not seen much of an improvement over the previous version. You mean there are actually changes other than a new name?